ENVIRONMENTALISTS, worried about the fate of Africa’s dwindling elephant population, cheered when China announced a ban on the sale of commercial ivory last year, but an increasingly popular substitute is raising concerns of its own. To sustain a carving and collecting tradition that is centuries old, many Chinese artisans have turned not to ivory from elephants, but from the tusks of extinct mammoths harvested from an unlikely place: the melting permafrost of Russia’s Arctic. While mammoth ivory has been promoted as an ethical alternative, since it does not come from the poaching of live animals, some conservationists argue that it fuels demand for ivory in general. And, the mammoth ivory industry, they say, could end up providing legal cover for the black-market trade in elephant ivory. 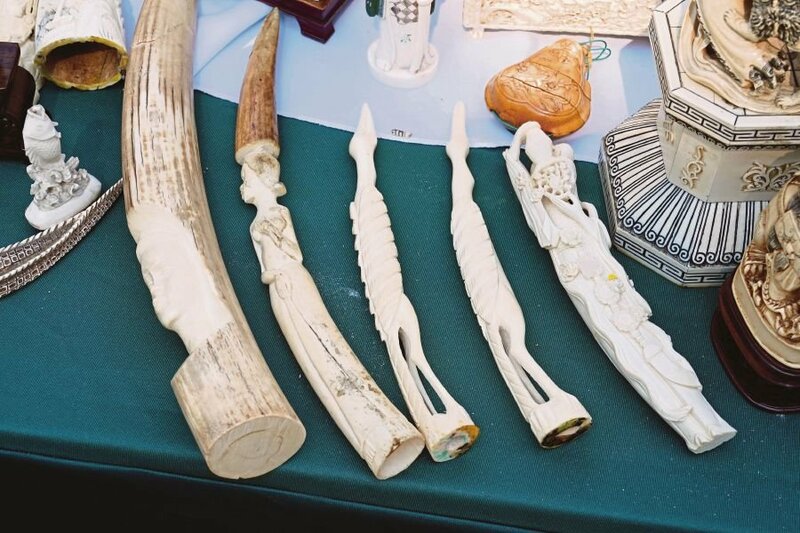 The legal importation of mammoth ivory, which comes from creatures that vanished more than 3,600 years ago, has skyrocketed in China as dealers and carvers seek a substitute to slake an insatiable market’s demand. In the first six months of this year, more than 27 tonnes of the ivory entered Heilongjiang, the province that borders Russia’s Far East, the government there announced recently. In the same period last year, it was less than four tonnes. More mammoth ivory funnels in through Hong Kong, where imports are now averaging 34 tonnes a year, three times the average in 2003, according to one estimate. “If we can get more, we can make more,” said Wu Xinghua, an owner of Jin Sha Mammoth, which operates five workshops and two galleries around China that produce and sell jewellery, pendants and other intricately carved figures. The drastic shift in the ivory market, though, is raising a host of concerns that could temper the accolades China won for its plan to phase out commercial sales. The two types of ivory can generally be told apart by their appearance — mammoth ivory is often darker on the outside — and by the pattern of cross-hatching. But, conservationists worry about anything that could help the elephant ivory trade, which has proved difficult to stamp out. “As long as there is a legal trade in mammoth, ivory of all kinds can be laundered into it,” said Mark Jones, associate director for policy for the Born Free Foundation, a wildlife conservation organisation based in London. Beyond that, China’s appetite for ivory also appears to be encouraging a shadowy network of traffickers working in Russia. In April, the authorities in Heilongjiang seized a tonne of mammoth ivory, including 107 tusks, that a truck driver was smuggling across the border hidden in compartments of a tractor-trailer to evade Customs duties. Legal and illegal shipments are believed to flow through Hong Kong, too. When the United Nations-backed Convention on International Trade in Endangered Species banned the sale of elephant ivory, with some exceptions, in 1990, China was given an extra year to comply. In 2008, when the convention allowed a controversial auction of ivory stockpiles amid signs that the herds in Africa were recovering somewhat, China bought 68 tonnes, while Japan bought nearly 42. That is, officially, China’s only stockpile, and it is dwindling as the ivory is auctioned to factories. Illegal trade, however, has flourished, as has poaching in Africa. According to an authoritative survey by the International Union for Conservation of Nature last year, 93,000 to 111,000 elephants were lost from 2006 to 2015, the most precipitous decline since the 1970s and 1980s. Most of the ivory ends up in Asia, especially China. Under growing pressure because of the slaughter, China’s president, Xi Jinping, pledged to impose a ban in 2015 during a meeting with then United States president Barack Obama. Last December, the government detailed the plan for phasing one in, and since then, has seemed serious about enforcing it. In March, the State Forestry Administration, which oversees the trade, ordered 67 factories and retailers to close. Zhang Dehui, the agency’s director for wildlife, said in an interview that another 27 factories and 78 stores would also have to close by Dec 31. The police have also been cracking down. Last month, they seized 3,185 ivory items being sold by unlicensed vendors in a market in Beijing’s Chaoyang District. The ban has nonetheless thrown the market into upheaval. In Nanjing, a city of eight million on the lower Yangtze, six of seven retailers closed with the first wave in March. The last one open is the Nanjing Arts and Crafts General Co., a state-run gallery exhibiting all manner of crafts, though for the moment, ivory holds centre stage in the store’s glass displays. Signs hanging around the store offered 68 per cent discounts on virtually all of the roughly 10,000 pieces the store manager, Liu Zhengyu, has to sell before the end of the year. Chopsticks, amulets, bracelets, pendants, even a showpiece, an intricately carved dragon boat that previously cost US$225,000 (RM964,000) — everything must go. Liu said his store would survive by selling other craft, but holding an intricately carved ivory sphere containing 21 increasingly smaller, free-moving spheres inside it, he lamented what would be lost with the ban. “A lot of people will stop doing this,” he said.